Looks impressive, what’s not to like? Just that, once you discount the hype, it’s not very different from what’s been done by past governments, whether the United Progressive Alliance (UPA) or the United Front (UF). All of which adds up to ₹1,22,265 crore, close enough to our headline figure. But how remarkable is this effort? 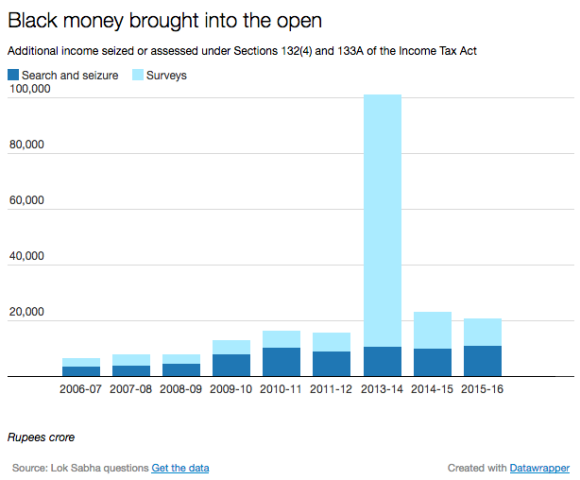 Black Money bought into open - Additional Income seized or assessed under section 132(4) and 133A of Income Tax Act. Isn’t that interesting. Using the same definitions used by the Modi government, it turns out that the quantum of black money exposed in the last two years of the UPA was more than ₹1,30,800 crore. 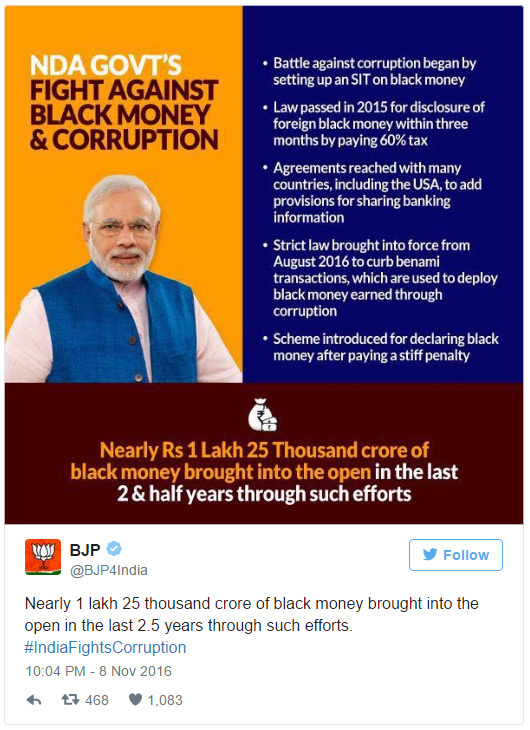 That’s right – the UPA tracked down more black money than the Modi government did, and in a shorter time frame. As always, there are caveats. Not all the money assessed under Section 133A should be strictly considered “black”; some of it consisted of income that taxpayers felt was not taxable for whatever reason, but the authorities disagreed. Still, if the Modi government wants to count all those funds under its “black money” haul, it cannot deny the UPA credit for a bigger haul. That’s fine, you might say, but hasn’t the Modi government adoped a much more comprehensive approach to black money than the scam-tainted UPA? It’s passed bills to bring back black money, succeeded with its income disclosure scheme and, as Modi himself stated, reached agreements with many foreign countries to provide tax information. The Modi government has indeed passed bills that raise the penalties for the concealment of foreign income and beef up the handling of benami properties, and we have to see what effect they have. But it’s not clear that income disclosure schemes even work, leaving aside the obvious unfairness of giving tax criminals a break while the rest of us cough up our cash. A similar scheme in 1997 resulted in close to half a million persons declaring ₹33,695 crores of previously undisclosed income, equal to ₹85,153 crore in current rupees and a third higher than the Modi government’s bounty. I think we can all agree that it didn’t make much of a dent in India’s black money problem. What about black money transferred outside of India, which the Washington DC-based Global Financial Integrity estimates averaged US$51 billion per year between 2004 and 2013 (some of which likely returned as foreign investment via “round tripping”)? In his demonetisation announcement, Modi referred to “agreements with many countries, including the USA… to add provisions for sharing banking information” that could help make international tax evasion more difficult. A process has been underway since the 2009 G20 summits in London and Pittsburgh to improve transparency in international financial transactions. 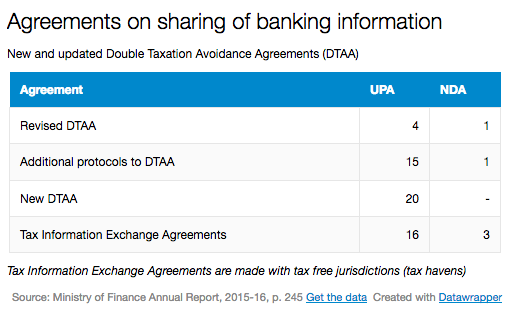 This has translated into an effort to include banking information in both existing and proposed Double Taxation Avoidance Agreements (DTAA) that India has (currently with 95 countries), and to reach Tax Information Exchange Agreements with countries that India doesn’t have a DTAA with, mostly tax havens such as the Bahamas, British Virgin Islands etc. That doesn’t mean that the Modi government has been lagging: in May 2016 it finalised an important DTAA renegotiation with Mauritius, the island nation that has been the source of a third of all FDI inflows since April 2000, and is believed to be the main gateway for round-tripping. India will impose a capital gains tax of half the Indian rate on investments from Mauritius starting from April 2017, and the full rate from April 2019. A similar agreement with Singapore, the second largest source of FDI into India (16% of the total), is in the pipeline. The idea is to remove one incentive for round-tripping: saving on capital gains tax. In summary, there has been a robust G20-supported process underway for several years to bring transparency to international financial information, which Modi certainly didn’t start, and had little choice but to go along with. This article was originally published by Chunauti.